Growing up, I have fond memories of big holiday dinners with my extended family members on my father’s side – aunts, uncles, great aunts and uncles, grandparents and lots of cousins. 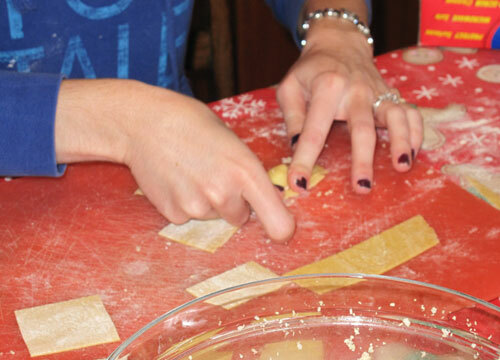 Being Italian-American, the holidays always revolved around food. A lot of food. In fact, us cousins would get super frustrated on Christmas Eve because it took so long to eat all the different courses. By time we got to dessert, which usually involved homemade Italian cookies, the adults seemed to take forever to drink their coffee. All we wanted to do was open presents. The most important part of the Thanksgiving and Christmas Eve (and sometimes Easter, if we were lucky) were the cappelletti. 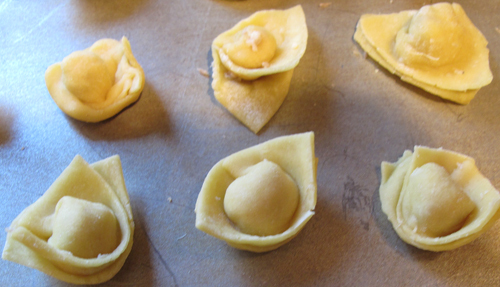 Cappelletti are pasta in the shape of a small hat. The “hat” is usually filled with a combination of meat and cheese. As far back as I can remember we started our holiday meal with cappelletti soup. I think most of us would have been happy to only have cappelletti soup. It is that good. There’s something about the filling in that little hat that gives it such a rich, amazing flavor. 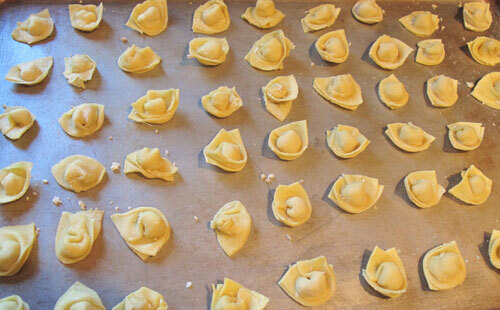 The thing with cappelletti is that they are extremely labor intensive to make. In fact, it seemed that only a few little old Italian ladies would make them around the holidays. They were a hot commodity growing up in the Milford, Massachusetts area, and I have yet to find them outside the area. 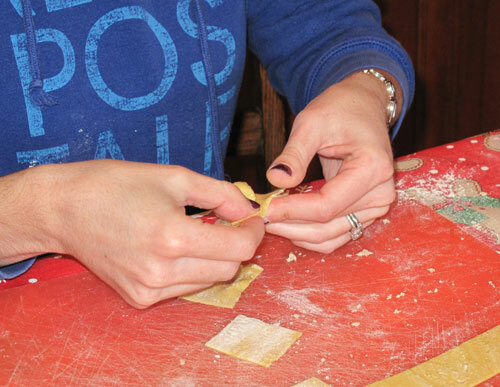 Step 1: Put the filling in the middle of the pasta square and fold in half. Step 2: Twist the dough, putting the folded edges together and pulling up the edges to make the "hat." This weekend was the third year in a row my parents and sister made cappelletti. It was my second time helping, and the first time my boys got to pitch in. G, my six year old, got to put the dough through the pasta machine, while my mom cut the pasta into squares. My sister, dad and me put the filling in the middle of the pasta squares and made the little hats. Biz, my almost 3 year old, was content playing with his own piece of dough by our side. It took a few hours, but we ended up with 401 (Biz got to make the last one) cappelletti filled with pork, veal, chicken and romano cheese. Yum! The final product - cappelletti pasta for soup. My mom just used ground beef and that was it and it was soooo good. My mom would make these when we were growing up. I LOVE THEM. Passattelli as well. She passed away and I finally found the recipe online. However, we just used regular cooked ground beef for the cappelletti. The broth was chicken. But the left over ground beef was tossed inside of the broth too. Put in a chicken heart. Oh wow. My mouth is watering!!! I need to buy a pasta machine though. I have a hard time getting the pasta thin like my mom did. The pasta machine definitely helps. I love pork and veal in the filling. Now I want some too! I think next time we make them I might try to do a video on how to fold them. It’s all in the technique! Folding them is very easy. We would make a square. Put the meat, fold it in half. Like you’re folding a napkin. Then make two of the ends meet. But a video would be so great. You know where I had finally found the actual recipe was a neat web site of a restaurant in Italy. I’ll send it to you. When I think about them, I want to cry because my mom has been dead for almost 10 years now and it was such a wonderful memory of her. Besides tasting good, cappelletti bring back wonderful memories for me too. It makes me happy to hear others are continuing the tradition in their families as well. I think that flip at the end of the fold for me was the hardest to do. It seems easy now thought! Here is the link to the place. They have great photos! I WANT SOME NOW!!! LOL! !